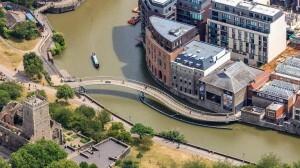 Channel 4 looks set to open its Bristol creative hub in the city’s Finzels Reach waterfront development this autumn. The broadcaster announced its plans to open the base, employing around 50 people, last October under its plan to decentralise decision-making and programme commissioning out of its London, where it has its national headquarters. Since then it has looked at a number of buildings in the city but this week said it had decided to move to the historic Fermentation Buildings on the former brewery site opposite Castle Park, pictured. Channel 4 will lease 3,200 sq ft of space on the historic building’s second floor – making it the latest arrival in an area which Bristol-based developer Cubex hopes will become a magnet for media, design, film and TV businesses. Channel 4 has said its Bristol creative hub will be “a base for key creative decision makers supporting Channel 4’s relationship with the production sector – with a particular focus on supporting genres strongly represented in the South West, Wales and Midlands”. The new creative hub in Bristol will be a base for key creative decision makers supporting Channel 4’s relationship with the production sector – with a particular focus on supporting genres strongly represented in the South West, Wales and Midlands. Commissioning departments based in Bristol will include drama, factual, factual entertainment, formats and features, Channel 4 said. The hub will also include a creative diversity team to support on and off-screen diversity – a move in keeping with the stance taken by Bristol City Council, which spearheaded the bid to bring the broadcaster to the city and promised to work with it to promote social mobility initiatives that would work with diverse communities and bring new talent into the industry. Channel 4 chief commercial officer Jonathan Allan said: “We looked at a number of different sites in Bristol, but the Fermentation Buildings stood out for us as offering both a great location at the heart of the city in reach of transport links, and an historic industrial building with superb facilities on hand for our staff. Channel 4 said it was in advanced negotiations with Cubex to locate to Finzels Reach, which was the epicentre of Bristol’s brewing industry for hundreds of years until the last occupier, Courage, it closed in the 1990s. Cubex, working with funder Palmer Capital, has spent the past few years transforming the site into a new community in the heart of the city. Finzels Reach’s first phase, which is nearly complete, includes 440 apartments, 240,000 sq ft of office space including two Grade A office buildings, a 168-bedroom Premier Inn, plus cafes, restaurants and a microbrewery across 30,000 sq ft of space. Cubex director Peter Walford said: “We are thrilled that Channel 4 has chosen Finzels Reach as the new home of its creative hub. This move is hugely significant for the city, far beyond the size of the hub itself, and testament to its thriving television and production industry. “This comes after other creative companies including BDH and OUTLAW announced their move to Finzels Reach, paving the way for the creation of a creative and media business hub within the quarter. Around 2,500 people will be living and working at Finzels Reach by the end of the year. BDH, which won a BAFTA in 2018 for Best Titles and Graphic Identity for Blue Planet II and is also known as Burrell Durrant Hifle Design & Direction, acquired a 1,900 sq ft studio in The Maltings at Finzels Reach earlier this year. Having spent their careers in London agencies, the team behind OUTLAW was drawn to Bristol’s thriving creative scene as well as the appeal of being based in the heart of the city centre at Finzels Reach. Founded last summer, the firm creates disruptive designs for brands. It is now looking to grow its new venture by creating 15-20 jobs over the next few years. It has taken 2,594 sq ft of space on the same floor of the Fermentation Building as Channel 4. CBRE acted on behalf of Channel 4 with Knight Frank and Savills representing Cubex. Channel 4 is also opening a new national HQ in Leeds and a second creative hub in Glasgow.